During the autumn of 1999 Malcolm Gill of Axmouth started a search for a small sailing dinghy of a similar design to the A.O.D. Having had no success in locating a suitable second hand boat he decided to have a new dinghy built by the Cornish boat builder – John Fuge. The initial intention was to construct a comparable dinghy of around 12 ft, however the plan progressed a step further – why not construct an Axe One Design? Over the Christmas holidays of 1999 Whimbrel was trailed down to John’s yard at Golant on the River Fowey. He carefully took off the lines of Whimbrel and then with his apprentice Peter Williams commenced construction the first Axe One Design to be built in 40 years. This started a close association with the River Fowey and the Axe One Design. Shearwater, No.20 (following on from the 1959 list) was launched at Axmouth in June 2000, the occasion being coincidentally marked by a fly past from the Red Arrows! The craftsmanship and detail employed by John & Peter has produced many admiring comments, the standard of finish is both exceptional and beautiful. 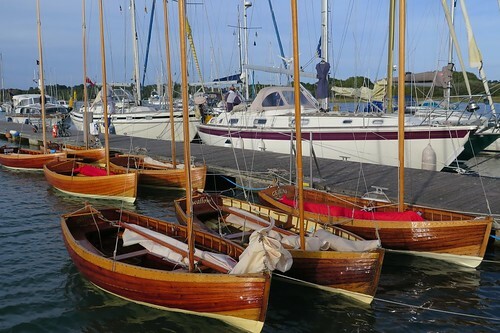 The two boats have been back to Cornwall and have sailed the Fowey, Fal and Helford Rivers, which has become a regular annual event; now including Fowey Classics. The building of Shearwater sparked renewed interest in the class. During the winter of 2001/2 David Trezise of Axmouth made the journey to Fowey to place an order for another Axe One Design. By this time Peter had set up his own boat building business at Bodinnick, with John having retired; although he still took an interest in the class. Freddie No.21, was launched from Peter’s yard on the Fowey in May 2002. To keep the momentum rolling, Mike and Jane Calvert of Axmouth placed an order with Peter during the 2002/3 winter, continuing the annual production line with the building of Teal, No.22. She was launched in late April 2003 at Bodinnick and took her first sail on the River Axe in early May of that year.